Are puzzles important in the classroom? 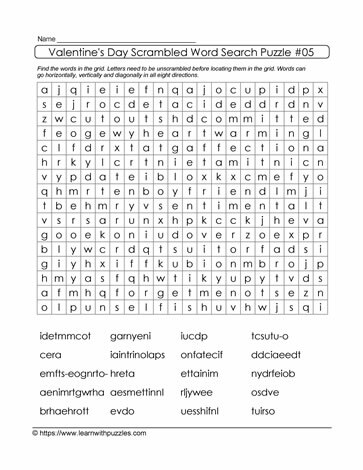 One tool available to Educators is the word search puzzle. Word search puzzles help support students as they learn new concepts and further consolidate vocabulary. They also provide an assessment tool for educators. This Valentine's day-themed word search puzzle gives a greater challenge because the list of words has letters scrambled. To solve the puzzle students must first unjumble the letters, and then locate the words hidden in the grid. As students work to solve the puzzle, they are consolidating their knowledge base of these Valentine's words. Educators observe students' word attack skills, problem solving strategies, and whether or not students will seek help from their peers. These observations help to identify learning gaps and help to inform instruction.